The Armed Man. Photo credit Ian Thomson. Jenkins' The Armed Man: A Mass for Peace (1999) is an important contemporary work with extraordinary public rapport. Audience response to, for example, the sudden explosive shock of bass drum and Hefin Owen's collection of edited newsreel images was palpable. Jenkins repeats the structure of a Catholic Mass but makes a universal message by framing it with the 15th-century folk song The Armed Man and a Muslim Call to Prayer. The work also uses passages from Kipling, Tennyson and Toge Sankichi. The soothing wrap of religiosity plays its part alongside the posturing war leaders, Jenkins' ''bloody men''. Unfortunately, even Jenkins bookends war's traumas between nationalistic rallying of the fit and young and the outpouring of joy at the survivors' return. They are thereby inevitably justified and salved, at least for the victors. The performance, driven by Burchell, was rivetingly good; almost professional. Gorecki's a cappella Totus tuus successfully set the scene. 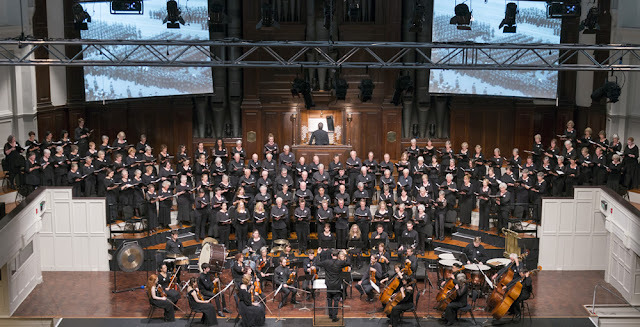 City Choir Dunedin gave its full commitment to very credible victims' screams and laments. Its Kyrie, Sanctus, Agnus Dei, and Benedictus were all beautifully articulated with fine sentiment, while its Charge! and Torches convincingly portrayed anguish. Mezzo soprano Claire Barton's Now the guns have stopped was most beautifully sung. Tenor Ben France-Hudson and treble Jesse Hanan both have fine, strong voices. Muezzin Dhafir Moussa's Call to Prayer, Nigel Tucker (bass) and Sophie Gangl (soprano), comparatively unaccustomed to solo singing, are commended for their efforts. The Dunedin Symphony Orchestra brass and percussion sections deserve special mention, as does Helen du Plessis' solo cello work. Review by Marian Poole, Otago Daily Times, 3 April 2017.